“We were really hoping for a cup of tea,” my friend added. Miss Lily’s Café had looked so inviting from the highway. 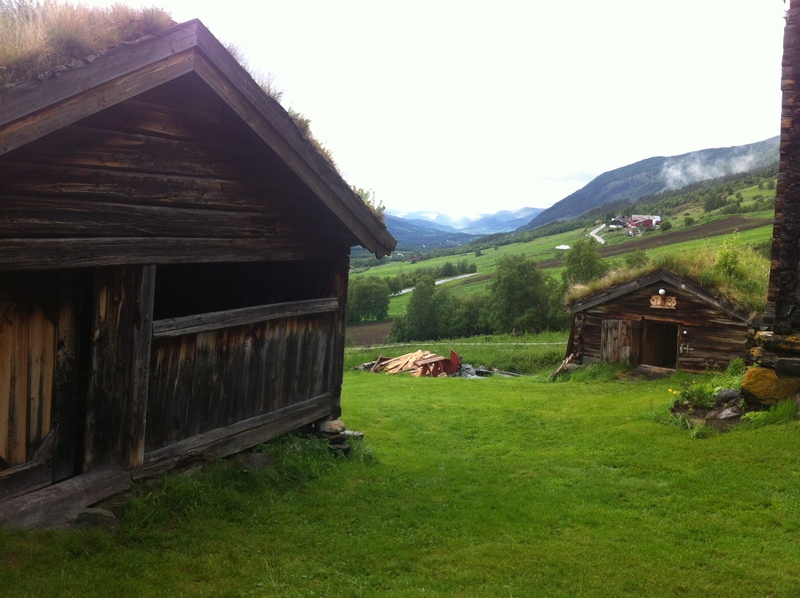 It’s a rambling, log-cabin bungalow of a building, dark logs with white calking, a big front veranda and a red roof. We’d driven off the highway on a long curve that took us by a chapel – no cross but a big red heart on the steeple – and a few other cottages and outbuildings. Given the fact that when we pulled in we were the only car at Miss Lily’s, the truth was that we’d suspected it was already closed. But there were still iron patio tables out on the wooden deck, and streamers of American flags shared space around the windows with various Christmas nick-knacks. A stuffed snowman in an elf-costume stood sentry by the door, alongside a Christmas tree decorated in sparkling balls and straw ribbons. The place was too Smoky Mountain, and too enchanting, not to at least knock on the door. “Oh for God’s sakes,” came a woman’s voice from inside. “Let’s just give them some tea.” The man turned his head around and said something to the woman, and then held open the door. The woman – Miss Lily? – was sitting with her feet up at a little table inside. She had a glass of beer in front of her and a huge piece of some kind of pie, smothered in meringue. “Y’all just relax,” she said to us, although she didn’t move herself. “He’ll get something going for you.” She was going over some figures on a sheet of paper when she noticed me eying her pie. “Do you like coconut cream?” she asked. “And get them some pie while you’re in there!” she yelled to the man. Within a few minutes we were set up with a pot of tea and two very large pieces of pie out on the deck. The afternoon Tennessee sun, and the tea, warmed us in spite of the cool mountain air. When we finished we carried our cups and plates in to the café. Lily was still going over her figures, feet up. “Did you like the pie?” she asked. I didn’t dare tell her that there had almost been too much. I told her the truth – it was delicious. There were probably still flakes of the tasty crust in my beard. “What do we owe you?” I asked. She waved her hand at us. The holiday, clearly so important to everyone around us, had to that point in the day meant almost nothing to the two of us – a Canadian and a European, both foreigners. But hospitality is universal. “Happy Thanksgiving” Miss Lily smiled. In terms of the difference between the two, Andrew pointed to the inevitable overlap, but highlighted subtle and sometimes briefly maintained differences in motivation and ritual. Well said, well thought. Trying to see a city in four hours feels a bit like speed-dating: you’ll hear a story, you’ll get an impression, but it’s not enough on which to build a relationship. The cheapest ticket north from Frankfurt to Stockholm is an Air Baltic flight that sticks me in Latvia’s capital for a layover too long to sit and do nothing and too short for a real, proper visit. Where some might find that annoying, I’ve never been to Riga. A quick run in seems the least I can do. Fortunately, the airport is small. The pretty woman in blue at the city information desk is incredibly friendly and helpful. Yes, I can take a taxi, it’s right over there. But why do that when the city bus is almost as fast and costs one-thirtieth the amount? I don’t want to change money for four hours, so I charge the equivalent of one euro for two bus tickets. It leaves over there, from the other side of the parking lot, she points, handing me a card. In two minutes. You’ll have to hurry. I run out the door and into cool straw-yellow Baltic sunshine, me and my backpack bouncing the 100 meters or so to the waiting bus. I’m in my seat, still breathing heavy, when I hear someone calling me. “Sir? Sir?” Coming down the bus aisle is the same woman in the blue uniform. Sir, she says, smiling, I forgot to give you your second pass. Here it is. She has run the whole distance behind me, in stilettos, to give me a ticket worth 50 cents. Bus #22 is half-full. Young men in sunglasses, clearly airport workers off-shift, polished leather shoes and pressed shirts, lean against the windows of the bus with their eyes closed and ear buds in. Small old men sit in suits that seemed as grey as their skin, while several elderly women in shapeless but colourful shift dresses peer into each other’s huge paper bags and chortle in a language impossible to understand. 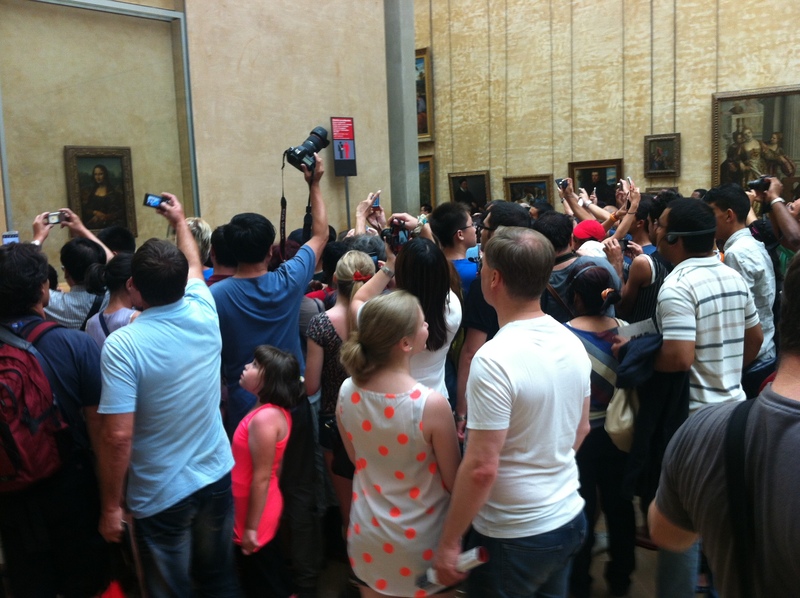 Hipster couples, the men in shorts with deck shoes, the women in red pants with v-necked sweaters, hold swaying baby-carriages in place. Beside me sits a pair that look for all the world like some younger, Baltic version of Brangelina. He a rougher Brad Pitt in a white tee-shirt, and behind her sunglasses, high heels and fur-lined vest, hers an adolescent Angelina smile. We pass by gaunt old concrete apartment buildings, interspersed with modern concrete homes. Occasionally there is an old framed cottage, the wood grey with age, fading paint and single-pane glass, old flowerboxes gone to colourful riot. At the next stop three men who appear to be in their late twenties step on to my section. They move together, a unit of something that seems, from the reactions of the other passengers, foreign. One of them, bare-chested under an open Adidas jacket, turns on music as soon as they sit down. 60s style Russian, or maybe Ukrainian or one of the Republics, the singer’s voice floating over the seats. The old women stop talking and turn to stare. The three men seem oblivious, talking loudly, looking only at each other. When the Brangelina couple leave the bus, the woman gets caught in the doorway a second, her one high-heeled leg stuck for a second on the inside of the bus the occasion for great hilarity from the Russians. Where the bus drops me it’s only a few steps to the old town. A group of pre-schoolers, all dressed in bright tee-shirts, straggle at the hip level of their monitor as they pass under a giant statue of two officers in greatcoats and caps, back to back, looking out over the river. The squares are full of people. A Mexican ship is in port: small clean-cut men, their skin olive against the bleached white of impeccable uniforms, carry cameras on their belts and examine the wares of the street sellers. The products are typically Baltic: carved wood, bright, intricate knitted goods, and amber in every possible shape and setting. I’m trapped at one of the tables in front of a statue of the Bremen town musicians. The woman managing the stall seems as excited for a chance to practice her English as to show off the wares, which are beautiful, but exactly the same as at the next table. Further down I notice traditional wooden Russian dolls painted with European soccer players. In one of the shops I come across unique and exquisite ceramic houses like some that I saw coming into town. I’d like one, but where would I put it? The churches are quiet and simple. I take photos of some of the art deco ornamentation that graces the buildings. The statues and monumental reliefs are…. well, monumental. These are twentieth century work. Big-shouldered men in army uniforms and helmets, carrying rifles. 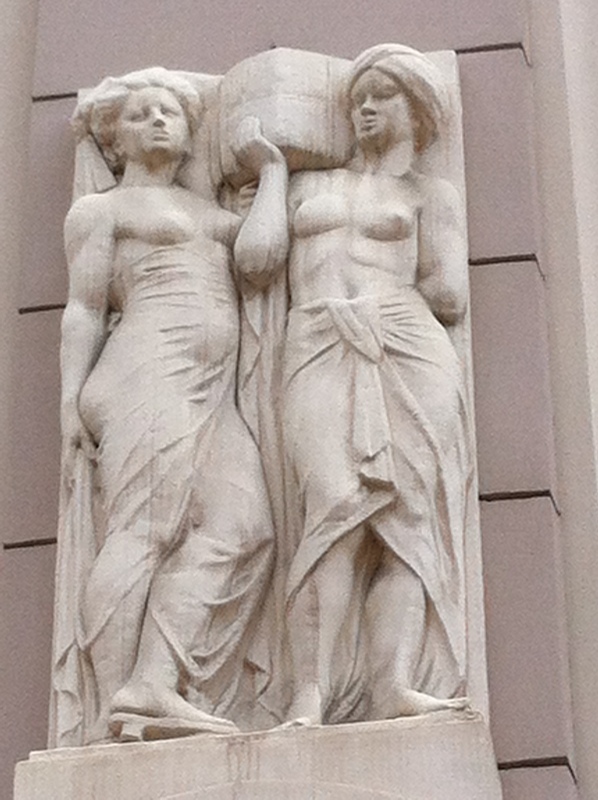 Big shouldered, bare-breasted women, carrying heavy loads. There is another giant statue at the opposite edge of the old city, titled “Freedom”. 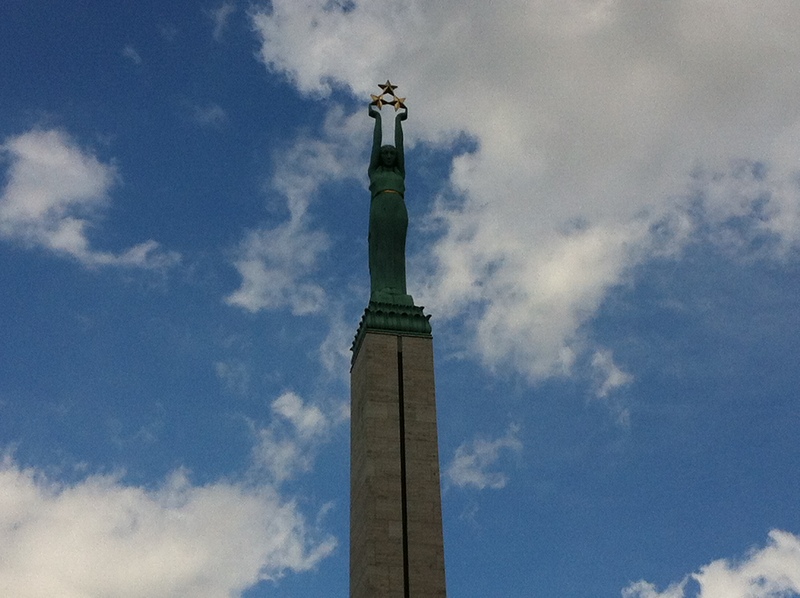 On top of a granite column high above the street, the two-storey, stylized figure of a woman in a robe thrusts three golden stars up to the heavens. Perhaps it was called “Progress”, I think. 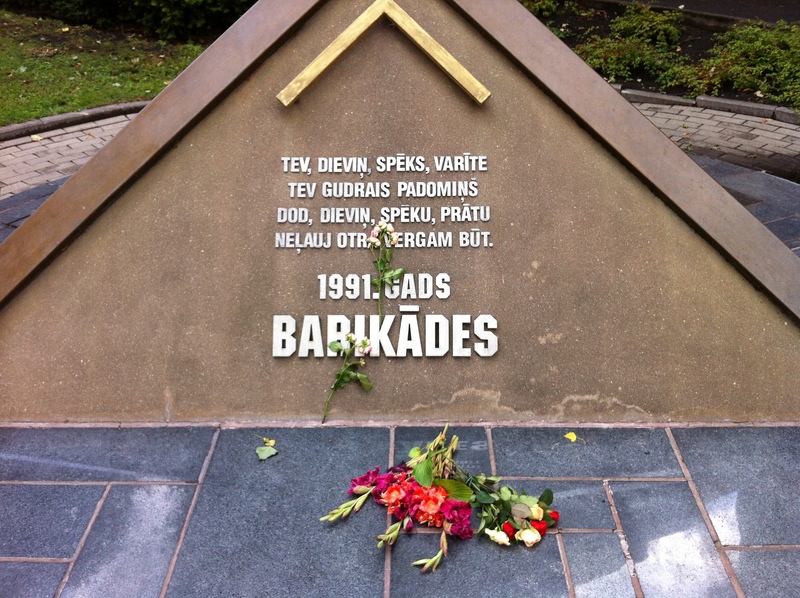 Later on I walk by a small triangular shrine, quite different from the monuments, simply titled “1991 Barikades”. There are fresh flowers on it. Here and there I see testimonies of struggle, pocketed between coffee shops and western fast-food franchises. But I’m like a half-deaf man trying to hear a conversation about a subject I don’t recognize. A tram passes. I think that its compact size, clean lines and wrap-around windows make it look retro, like something from the 1950s, and then realize that it probably is a piece of equipment still in use from then. 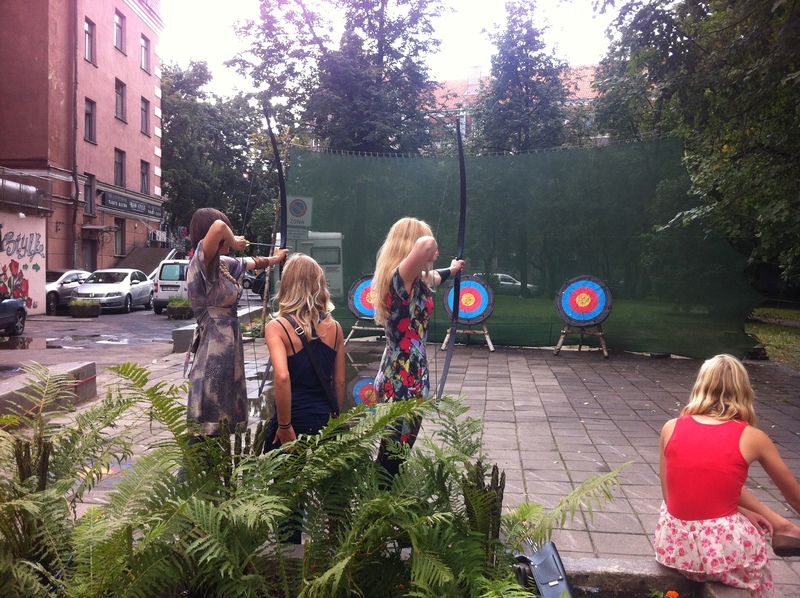 On the street nearby, a group of women laugh and talk to each other in Latvian as they take turns releasing arrows at an archery range. I’ve just enough time for something to eat before going back to the airport. There’s an old convent across from the street sellers, converted to a restaurant called “Domini Canes”. I take that as a sign and sit down. The waitress brings me a bowl of ginger-lamb-lentil soup. The presentation looks like something from a flight magazine: trickles of balsamic reduction on the four corners of a large white bowl, traced with herbs and flowers. For a second I could be in Paris or London, Toronto or New York or Hong Kong. Then I take a bite of the bread. It’s thick and brown and heavy, tasting of molasses, spread thick with butter and garlic, and says only one thing: there’s nowhere quite like Riga.